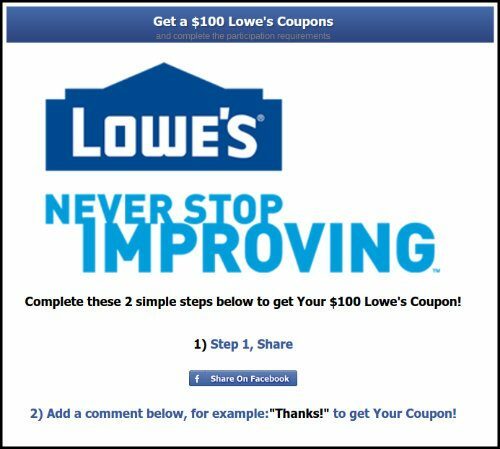 Lowe's is giving out coupons worth up to $100 to Facebook users. , Costco, Amazon, and Kroger shoppers. 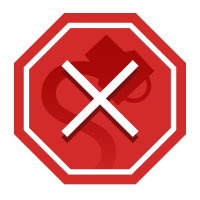 While each scam has slight variations, they all feature three main components. Scams like these require users to pass the fake coupon on to their Facebook friends. This widens the pool of potential victims. Next, they direct people to fill out a simple survey. While this seems like a harmless task, you’ll most likely be asked for sensitive information such as email addresses, telephone numbers, dates of birth and credit card numbers. Finally, users who complete the survey will never receive a free Lowe’s gift card. Instead, they will likely sign up for difficult-to-cancel “Reward Offers” or have their personal information used for nefarious purposes. Needless to say, anyone who attempts to redeem their coupon at Lowe’s will be unsuccessful (and probably a little embarrassed), and if they have followed the instructions, have set themselves and their friends on social media up for, at best, a like-farming scam. A simple racket, certainly, but an effective one.